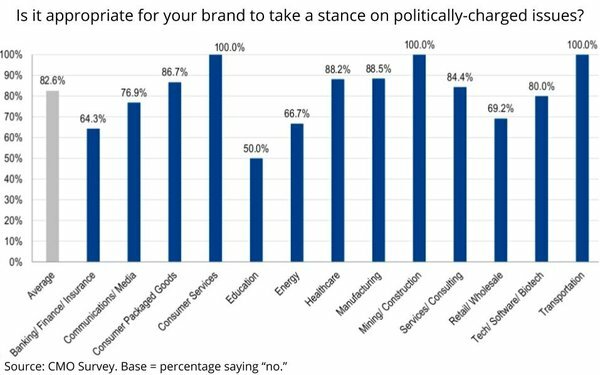 A year into the most politically- and brand-charged period in American history, a new poll of CMOs finds most of them believe they should keep their distance from politically-charged issues. The findings of the survey, conducted by Duke University's Fuqua School of Business, are even more pronounced than those of other studies, including one conducted in early 2017 by Advertiser Perceptions for MediaPost,. But averages can be misleading, because the study shows that marketers in different categories have more or less elasticity when it comes to associating their brands with political issues. Not surprisingly, brands in categories involving a fair amount of policy of issues oriented marketing, were more prone to find it acceptable, including Education, Banking/Financial, Energy, and Retail/Wholesale. On that last point, retail brands have been especially visible and vocal in public debates surrounding the Trump Administration, including Nordstrom, Patagonia, etc. Categories eschewing politics altogether include Consumer Services, Mining and Transportation. 1 comment about "CMOs Eschew Politically Charged Issues, Mostly". James Smith from J. R. Smith Group, February 21, 2018 at 10:17 p.m. Fear of getting involved! Is this reflective of "boardroom paranoia"? Case: many of these verticals are desparately seeking millennials' favor. As noted in a few MediaPost stories, millennials like brands that have positions on social issues...exemplified by this quote: "Millennials like to support brands that bolster their own sense of purpose – such as charitable giving (Tom’s Shoes) or eco-friendly causes (Patagonia) or social change (Dove)." I can understand why the mining/construction vertical would shy away but what's the deal with CPG and Consumer Service verticals?